I just returned from India where I got a chance to meet and interact with Thomas Friedman, the New York Times Op-Ed columnist, and also the author of the recent bestseller, “That Used to be Us”. The event (in New Delhi) was the launching of India Ink, New York Times’ India-based blog which is already receiving more than half-a-million hits/day. This is just one of a series of recent commentaries about India, both in the U.S and India, that expresses grave doubt about the sustainability of the Indian economic miracle, which made it the second fastest growing economy in the world. On November 1, the Wall Street Journal wrote a scathing article about India, placing it near the bottom in important aspects of starting and running a business. You can read it here. Projections of GDP growth for the year 2011 and 2012 have fallen sharply virtually every month this year. Some economists have even forecast a growth rate of less than 7% for 2012, down from 8+% just a year ago. It could be lower than that as the economists are always incremental in their projections. In U. S. dollar terms the GDP growth this year will be a negative 7%, since the rupee has fallen over 14%! India’s abysmal gender inequality statistics seem to have taken a turn for the worse. New data shows the country’s Gender Inequality Index (GII) worsened between 2008 and 2011, and India now ranks 129 out of 146 countries on the GII, better only than Afghanistan in south Asia. Worse than even Pakistan, the so called failed, misogynist state of South Asia! In Human Development India is 134 out of 187, better only than Sub-Saharan Africa. Today we see an article in the Wall Street Journal pointing out that the Indian rupee is the third worst performing currency in the world this year! 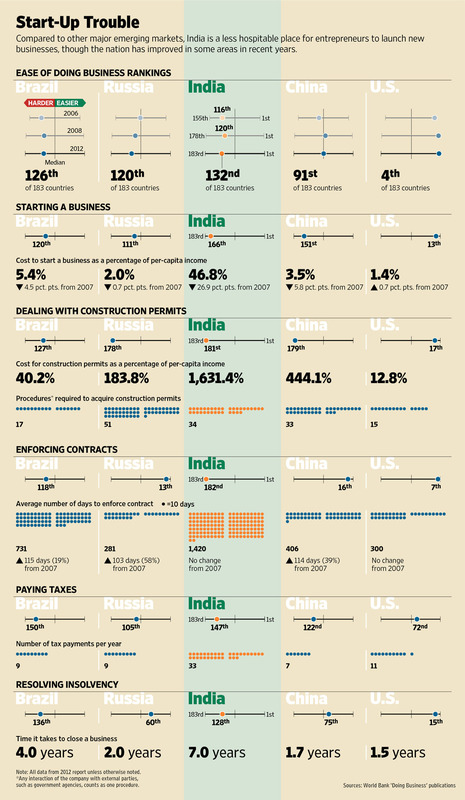 Foreign Investment in Indian companies, according to the article, has fallen by a factor of 20 from last year! The article is here for you to read. The Right to Information Act has entitled people to request and receive information on any government aspect or activity. The government is required to fork over the files and data within 30 days and they have set up a separate department that seems to be doing this fairly diligently. So people are able to track activities, such as, their tax refunds, government poverty projects even Swiss bank accounts of politicians. Activist groups have sprung up that are forcing the government to cede data on everything from environmental law enforcement to primary education to infrastructure projects. I met one such group that has currently 40,000+ members and is creating an Internet based network of activists that petitions the government using RTI. A national leader for reforming India’s corrupt and rotten elite structure has emerged and captured the imagination of the nation. He is a Gandhi-like figure and currently enjoying wide-spread, enthusiastic support from the masses. He has had some limited success so far in creating an independent ombudsman agency within the government to monitor corruption and graft. In one state (Uttarakhand) an ombudsman law has been passed which is pretty sweeping. It remains to be seen how successful all this is ultimately. Under the leadership of Nandan Nilekani, the former head of Infosys, India’s giant IT company, an ambitious plan to create a universal national database (UID) which ID’s every citizen is in progress. Instead of feeling that their privacy is being violated most people are enthusiastically embracing this process, which fingerprints and eye-prints everyone and builds a giant national computer database. I saw the process in action, when the UID builders appeared in the basement of my mother-in-law’s apartment to ID everyone there. Everyone, including my family members waited patiently in line to be scanned and ID’d. Already 100 million people have been inducted into the database. Just another 1,100,000,000 to go! The feeling is that the UID will be used to empower people directly, cutting out the corrupt middlemen and clerks, to disseminate government services and benefits, already authorized by law in many cases but never reaching the people. A strong environmental movement that has been modestly successful in curbing runaway development and destruction of “The Ridge”, an ecologically important watershed in New Delhi. They have managed to have hundreds of acres of sensitive land in Delhi declared environmentally protected and out of reach from people wanting to build shopping complexes there. I met some who are in this movement and they are earnest, articulate and willing to take on the government and rich interests. These are nascent movements and one hopes that they can take on a gigantic juggernaut of corruption and inefficiency. There are clearly strong head winds in India to sustainable growth. Are they being missed by those who keep touting it as a coming superpower? 3 Responses to India – The Faltering Tiger? I feel Tom Friedman has a more balanced perspective on the challenges and opportunities of India. I am however no fan of the WSJ series “India: A flawed miracle” they are running last few months and the below article is from that series as you may know. I find them to be either poorly researched or deliberate to publish something sensational to draw reader attention. Quite disappointing I must say to see that from WSJ. Yes the issues in India with corruption are real. However it is the introduction of acts like RTI that is now allowing such corruption to come out in the open (In other words such scum bags have always been in politics and we had no way to learn about them). Also we are now seeing arrests and jail sentences of corrupt leaders at the highest level which was thought impossible previously – AM Raja, Karunanidhi’s daughter, Maran, Ajit Singh, Bellary Reddy brothers, etc.. and we still have a long way to go and hopefully Anna’s movement will lead to a strong and pragmatic Lokpal bill. Not sure India’s issues of corruption are any different than the one we have in US with the lobbyist money. The environment issue in India is however a very serious one and I hope that gets more attention soon. I am spending lot of time with young entrepreneurs in India lately and I can’t tell you how excited I am about them. There is a 23 year old IIT grad who is building a carbon capture solution comparable to best in the world – I introduced him to Hitachi already. There is Phanindra Sama who started redBus as a 26 year old and it is today India’s #1 consumer internet company – more transactions per day than eBay or Amazon. More importantly his work is transforming passenger transportation in India turning previously unprofitable state transport companies to profit (Goa). There are two 23 year olds who started GharPay, an exciting payment solutions I have been mentoring and recently got Sequoia to co-invest…. I can go on about these innovative companies. But the best part is these young men almost all come from middle class families in small towns with no entrepreneurial background … they undoubtedly represent the best hope in my mind to lift India out of poverty. As you can tell, this is a topic dear to me and I am certainly not ignoring the enormous challenges India has ahead of itself. However I also feel there has never been a better time to bet on India if you are willing to accept a 10-20 year horizon. thanks for writing this stuff. While i usually ignore newspaper commentaries on India, good or bad, i do occasionally read paragraphs in The Economist, FT, and European magazines (who do a better job than US or India). You may have seen that even in films world, early Miramax movies came out of Europe and established its own class on audience’s mind. Friedman’s “world is flat” was initiated by Netscape’s founder by devising a browser that connects the world on a information highway, where any one can access any thing any where as long as it connected to the highway. Then the most creative and most organized minds took over. Goldman Sacks 2000 report sent the capital their way. “C” capitalized on that opportunity while “I” stumbled. At a macro level, earlier Bush used to talk about the axis-of-evil (Iran, North Korea, Syria? ), now we should worry about the axis of failure (India-Israel-USA). Even US elite is busy in attaching to China’s success and helping them do a better job than doing the same for the homeland, eg, Henry Kissinger, Paul Valker. Goldman Sacks coined the term BRICS, magazines then coined the term Chindia, and now the reality is that China and India have same economic separation as their geographical separation by Himalayas. In 2005 I had attended a seminar in Shanghai on “India vs China” where Indian speakers did not even show up. Others spoke of Bangalore airport having a red carpet in arrival that was stuck to the floor by some sticky tapes, and literacy was only around 50% level. Hope for India is her young entrepreneur class that is just emerging out in the past few years. Law and policy makers are busy and will remain so in working out their 1,000 crores per year plan into personal fortunes. We should make a fun movie on “1,000 crore ka sawaal hai, bhaiya”. While Chau-en-lai saved Mao-tse-tung from his cultural disaster, den-ziao-peng saved his successor from reforms-going-nowhere by coming out of his retirement and doing a “Rath-Yatra” to the southern states, there is no one in India who can save her, other than her own entrepreneurial spirit. Advani’s Rath Yatra can only bring disasters. His Yatra to Ayodhya was as bad as Brezhnev’s Yatra to Kabul. we all are paying a price for those Yatras. On the brighter side, corruption goes away, tat money is put into infrastructure, government policies become business friendly that includes Agro sector, licenses are cleared in 24 hours, and the brains get busy creating business opportunities that also employs the masses at the bottom of the pyramid. Capital outflow (from India) reverses its direction to Capital-inflow (into India). Thanks to VCs who have setup shops in India and some others who are setting up Incubators and Hatcheries. Nov 6, 2011 is when 6 of us met U in New Delhi. Poor Indians + more so, educated concerned have realized that Coterie led Indian Political Parties, instead of Parenting, have stolen & stashed Money in Tax Havens, leaving Indians fight for survival with non existing Basic Infrastructure.